Net farm income is one of the USDA’s most cited statistics. USDA’s measure of net farm income plays an important role in the design, implementation, and evaluation of agricultural policy. They are also used by farm input and machinery suppliers, agricultural lenders, and other farm-related industries to make business plans and projections. The USDA has produced annual estimates of net farm income since 1910. However, these official estimates are produced with a significant time lag, and as a result, the USDA has a long history of producing more timely forecasts of net farm income. This post examines the USDA’s net farm income forecasts since 1975. The USDA releases initial net farm income forecasts in February, in conjunction with the USDA’s Outlook Forum, and the forecasts are revised three times based on updated information on agricultural production and prices. The first revision is released in late-summer to reflect updated crop production estimates. The second revision is released in late-fall to reflect updated crop harvest information. A final forecast revision is released in February of the following year when the initial forecast of the next year is released. The USDA releases the official estimates of net farm income the following August, which included more detailed information from farm-level surveys. For example, the USDA’s initial forecast of 2015 net farm income of $73.6 billion was released on February 10, 2015. The USDA released revised forecasts of 2015 net farm income forecast on August 25, 2015 ($58.3 billion), November 24, 2015 ($55.9 billion), and February 18, 2016 ($56 billion). The official estimate of 2015 net farm income was released on August 30, 2016, at $81 billion. Figure 1 plots the USDA’s net farm income forecast from 1975 through 2015. The colored dots represent the forecasts and revisions for each year, and the solid line represents the official estimates (released the following August). Figure 1 demonstrates that the majority of the forecasts tend to fall below the official estimates, which suggests that the USDA forecasts tend to under-predict realized net farm income. For example, between 1975 and 2015, the initial forecast released in February under-predicted net farm income estimates by 8.7%, on average. The later forecast revisions also tend to under-predict realized net farm income, but the margin of error declines as the forecast horizon shortens. The August revision tends to under-predict realized net farm income by 3.7% on average, and the November revision tends to under-predict realized net farm income by 4.4% on average. The final revision, released the following February, is the most accurate with an average percentage error of 2.6%. Thus, while all the forecasts tend to be conservative, the new information obtained during the year improves the accuracy of the forecast. On February 7, 2017, the USDA forecasted 2017 net farm income at $62.3 billion. Many of the financial headlines focused on the continued decline of net farm income, but our analysis shows that these initial forecasts tend to under-predict net farm income. 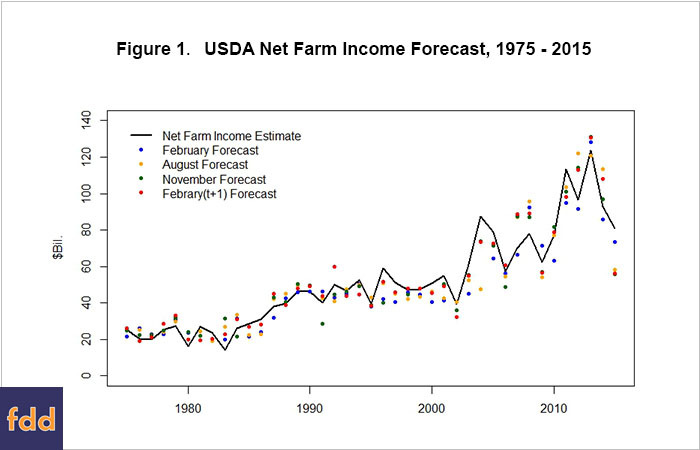 As a result, the forecast history since 1975 suggests that net farm income is expected to exceed this initial forecast. The USDA will release the first forecast revision for 2017 on August 30. With the additional information collected since the initial forecast, the revised forecast is expected to provide more accurate projection of 2017 net farm income. However, the forecast history suggests that the projections are likely to still be below the official estimates. McGath, C., R. McElroy, R. Strickland, L. Traub, T. Covey, S. Short, J. Johnson, R. Green, M. Ali, and S. Vogel (2009) "Forecasting Farm Income: Documenting USDA's Forecast Model" Technical Bulletin Number 1924, USDA Economic Research Service, Washington, DC.